The rapidly growing literature on the conditions of a happy marriage and on codes of behavior reinforced gender roles. 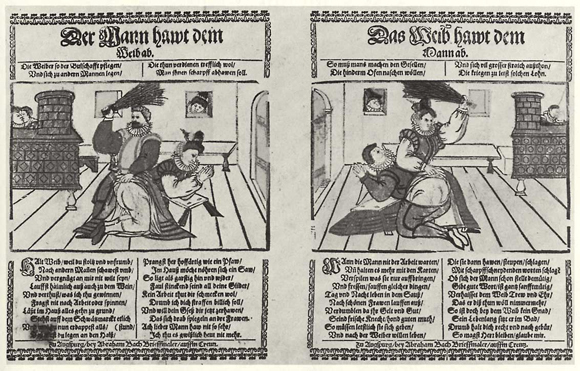 In the first scene of this two-part woodcut, a man beats his wife for being proud, impious, lazy, and drunk; in the second scene, a woman beats her husband for gambling, drinking, gluttony, and chasing pretty girls. Woodcut by Abraham Bach, second half of the 17th century. Please click on print version (below) for a larger version with enhanced resolution.